Description: This program is a small simple 3x3 tile puzzle. The objective of this game is to arrange the tiles one by one until you get the image to appear correctly, in the smallest amount of time possible. A timer that starts after you make the first move. An easy 3x3 game board. Clock glitch at midnight - If you are in game and the time changes to midnight, the timer changes to -23:59:59 and starts counting trying to reach 0:0:0.0000. Configuration dialog Customizable textures Photo walls with pictures in a folder of your choice. Sample pictures folder with 5 photos. The more photos used and the bigger they are, the longer it takes to load. Description: A Multi-purpose, multi-module bot designed for discord. Tailor it for your specific server, create your own modules and plug-ins. Includes a core module for custom text-based commands & more advanced command processing. This bot is in early access. A binary release is NOW AVAILABLE. Description: This utility shows you basic system information with a smooth and simple GUI. Description: A simple Icon for your notification area that serves as an indicator for caps lock and number lock keys. This is great as a replacement if the lights on your keyboard are either too dark to see or just don't work at all. icon that runs in notification. Real time monitoring of CAPS Lock and NUM Lock. Records with sample information based on your current audio output. Some machines: if you stop recording, and open another audio program, the audio from that program may cause glitches and feedback. Easily avoided/fixed by exiting after recording. Description: This program gives you a few keyboard shortcuts for the desktop. Please note this only works in Windows® Vista and later, and if you have multiple desktop backgrounds selected for the slideshow. Activated by CTRL+F5; Deactivated with CTRL+F5(again) or right-clicking the desktop/active window. Once active you click the desktop to cycle through the slideshow images you have set. Now if multiple windows are open, they will be minimized when activated. and restored when turned off. The standard shortcut (CTRL+B) on the desktop with no icons selected! Very tiny, Runs in system tray. If you forget to turn off the fast switcher, it will cause an annoying issue. If another window is selected and you press the shortcut keys the action is triggered on the window instead of the desktop, usually selecting another menu item, causing a system beep. Toggle Desktop may get reversed if a window pops up while using FastSwitch. There is a 90% success rate. No serious worries. Win+C may interfere with windows 8 and 10 using Charms OR Cortona. Description: A Simple GUI version of the windows Command prompt. This program enables you to use the command prompt with ease. Formally known as N00bPrompt. Reasons for the change is evident. Several quick access buttons that are most often used in the command prompt window. Enables typing custom commands, not provided by the GUI buttons. Some commands may cause the prompt to stop getting commands after the problem command is entered, Basically taking over the process. Description: This program basicly creates a copy of the file, but with the extension you choose. A console that tells you what to do. NEW: GUI that enables you to run the files! LOG: A console that logs the output of the program. None to be reported as of now. Description: This application was made to tell you if the specified number is prime or not. It will also tell you all the factors and multiplication combinations of the number. Compact GUI with list of factors and multipliers. Quick entry for faster responses. Status for the current operation. NEW: Prime factorization button. This shows the prime factorization (like this: 100 = 5^2 * 2^2). If an operation is complete, sometimes the cursor will stay as the wait cursor until you move the mouse. Description: A small utility that can calculate data usage percents and convert from one unit to the other. Depending on who you are, Some may see 1024kb in a megabyte and see that as wrong. Description: A program that allows you to express your musical talent while working with computers. This compact keyboard is full of various features and musical functions. Please note this requires a computer with Musical Instrument Digital Interface enabled hardware/software. 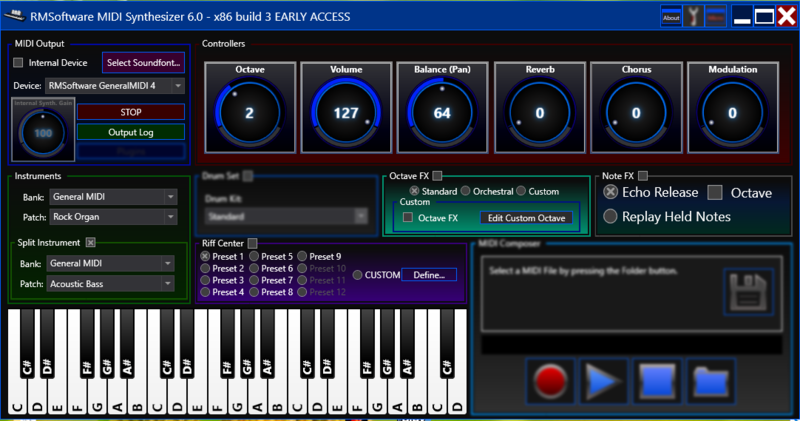 If you would prefer, you can get a virtual midi router and a soundfont player to add soundfont support to the program. See the documentation(in the about box on the program) for information about this. NOTICE: This program is in EARLY ACCESS. That means some features that appear blurred/greyed out on the synth may not work. These features are IN PROGRESS. This also means that some bugs have yet to be discovered. The feature list is only including working features. EchoFX note FX preset with octave support. PC SPECIFIC: Performance issues on various parts of the program. notably the riff center. Description: This is an old program that changes various window properties such as Size, Transparency, window title, and location. This program can run on machines with windows 98. Needs Visual basic runtime (6.0), which exists on pretty much every PC in the universe. Written in IX3 script. NOTE: For transparency effects, you should use windows XP or newer. Description: Description: A very compact Text to other format converter for your pc. Description: A very compact scratchpad for you to draw on. Very easy to use.